Hey guys! 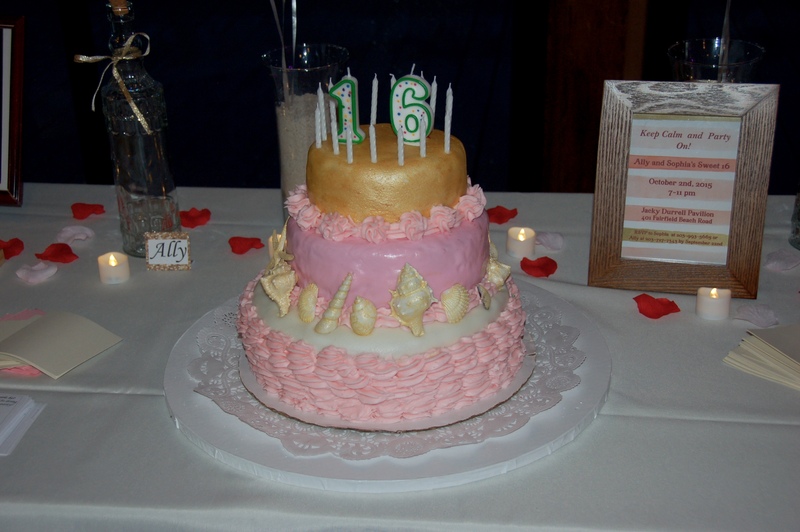 So, this past weekend I had the opportunity to make a custom sweet 16 cake for two of my friends, Ally and Sophia. 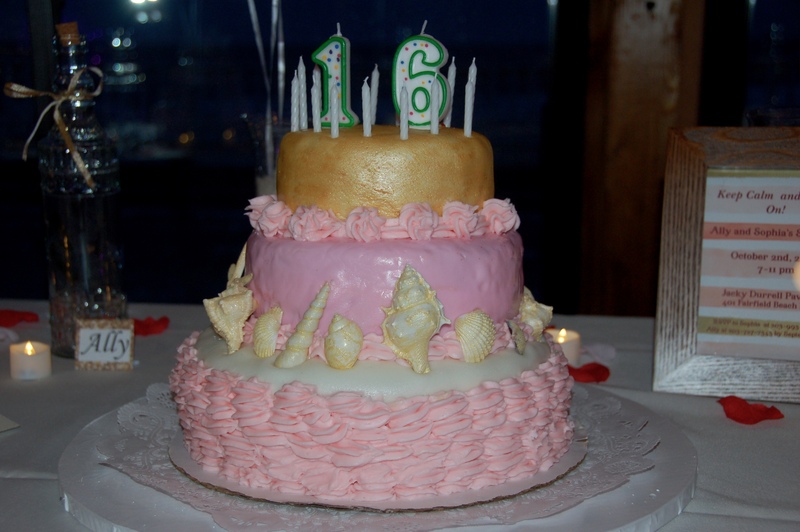 They were having a joint sweet 16 party, and I wanted to make them something really special. After going over their theme colors, we decided on a beachy gold and pink scheme, with a hint of maroon. How could I tie together all of those colors and ideas…? Red velvet cake! To be honest, I was always a little afraid of red velvet cake. (Is it chocolate? Is it vanilla?) So, I wasn’t sure what to expect when I baked the first few layers of this cake to freeze the week before the party. I had to find a fool-proof recipe, and I was prepared to try as many as I had to until I found the perfect one. But when my first batch of cake layers came out of the oven, they were a perfect rich burgundy color, soft in texture, and smelled incredible. From that step on, I did’t have to try out any other red velvet cake recipes, and I knew I had nothing to be afraid of. Making this cake was a lot of firsts for me. I had never made such a large-scale cake before, but I was excited to try! The girls really wanted gold on their cake, and so I did some research. Edible gold leaf costs around $10.00 per sheet, plus shipping and all of that extra cost, it went way over-budget. So, I came up with the next best thing… luster dust! Luster dust is made just for bakers, and can be used to add a little shimmer to sweets or to be painted over fondant. That’s what I did. On the top layer, you can see that it turned out a stunning gold shade, thanks to the luster dust. It was a lot of fun to mix the dust with lemon extract and paint the fondant like an art project. I definitely want to use more luster dust in the future to enhance my sweets! Finally, the girls saw a picture of a cake they loved and wanted me to recreate a ruffled sort of effect on the bottom layer. To do so, I made a ton of cream cheese frosting (what they had requested), and tinted all of it light pink. I used a star tip in a piping bag, and starting from the bottom, which was already covered with white fondant (my favorite recipe for marshmallow fondant is linked here), I piped little shell shapes in rows all the way to the top. I didn’t worry about making it look too perfect – ruffles can be a little messy, and it went well with their beachy theme. 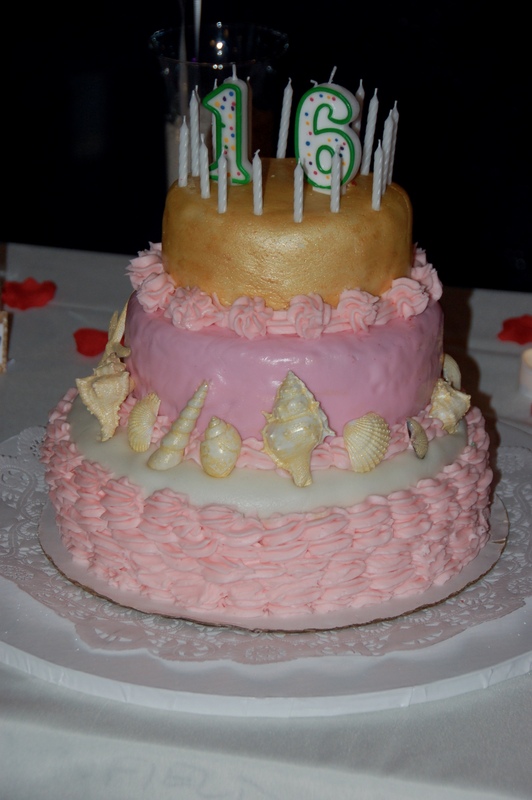 Top the layer off with some gold-dusted seashells, and you’ve got yourself a stunning cake. All in all, this cake was a lot of firsts for me, but it turned out better than I could have hoped. Enjoy this red velvet cake recipe – it’s truly delicious. And happy sweet 16 to Ally and Sophia! 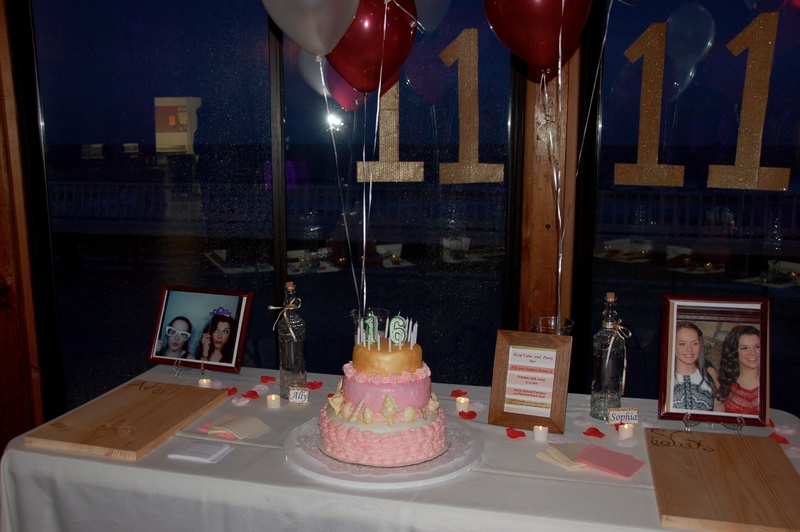 Thanks for letting Juliet’s Sweets be a part of your big day! Preheat your oven to 350*F. Prepare your pans by lining with parchment paper, coating with butter, or spraying with cooking spray. In a bowl, combine the flour, baking soda, and salt. Add in the cocoa powder and combine the mixture with a whisk for about 20 seconds. In the bowl of a stand mixer, combine the sugar and butter until it’s pale and fluffy. Add in the vegetable oil and the eggs one at a time, mixing just until combined. Add in egg yolks and then the red food coloring. In a liquid measuring cup, measure out the buttermilk, then whisk in the vanilla extract and vinegar. Working in three separate parts, beginning and ending with the flour mixture, add 1/3 of the flour mixture alternating with 1/2 of the buttermilk mixture and mixing just until combined after each addition. Scrape down sides and bottom of bowl with a rubber spatula to make sure everything is well-combined. Divide the mixture evenly among your prepared baking pans. Spread into a even layers and bake for about 30 minutes, or until a toothpick inserted into center of cake comes out clean. Cool in the pan for 10 minutes after, then run a knife around edges of cake to loosen it. When it’s almost completely cool – about 30 more minutes, flip the pans onto a cutting board to pop out the cakes. Once cool, feel free to frost with my Cream Cheese Frosting recipe. Enjoy!